The John P. Murphy Foundation of Cleveland, Ohio, was established by the late John P. Murphy, chairman of the board of the Higbee Company and a Notre Dame trustee for 36 years, until his death in 1969. A 1912 graduate of Notre Dame’s Law School, Mr. Murphy practiced law in Cleveland, eventually becoming president of the Higbee Company. In 1928 he served as president of the Notre Dame Alumni Association and, in 1952, he received an honorary doctor of laws degree from the University. 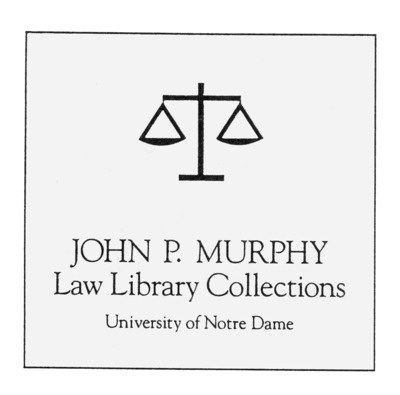 For two decades the resources provided by the John P. Murphy Law Library Collections have been vital to the development of the Kresge Law Library. For the first decade, the income from the fund was largely devoted to providing subvention of the library’s acquisition program. The purchase of primary legal authorities (case reports and legislation) as well as outstanding secondary materials (texts, treatise and legal periodicals) were supported by the fund. Over the last 10 years, the fund has helped to underwrite the library’s greatly expanded services as it grew to meet the developing mission of a research-oriented law school: microforms, computers, advanced communications technologies, automated library processing systems, online search systems, and continuing education of librarians have all been by-products of the fund. The totality of the collections and services supported by the Murphy Endowment have been, and will continue to be, a tremendous force in facilitating faculty and student research in the Notre Dame Law School.